New Year Greetings to you all. We have had a really excellent break and while we have been back for about a week, we have been concentrating on the alterations that are going to be done on our shop building. The plan is to turn it into our home...we will have a two bedroomed home in 2/3rds of the building and at the eastern end it will become our (smaller) shop premises. My longarm will have to stay in what will be our lounge for a couple of months while we get everything rearranged. Enough about that though, first off some of wht we did at Christmas with family. We had to sneak away from Tyson - first of all he thought he could masquerade as a Christmas present, then in a last desperate attempt he said if you want your bag - you will have to take me with it!!!! Daft cat! We spent our first night with son Daryll and his partner Dayn. Hamish is their 19mth old rascal. They live on a farm that is about 35 minutes out of Te Awamutu. Lovely and quiet and great scenery. 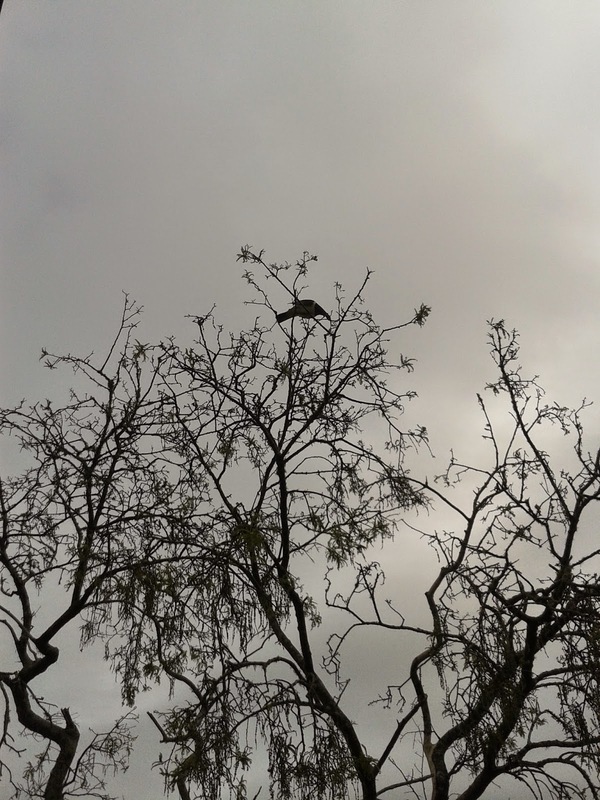 We were lucky enough in the morning to see and hear this Kereru (Native Wood Pigeon). I hope you can see it ok. 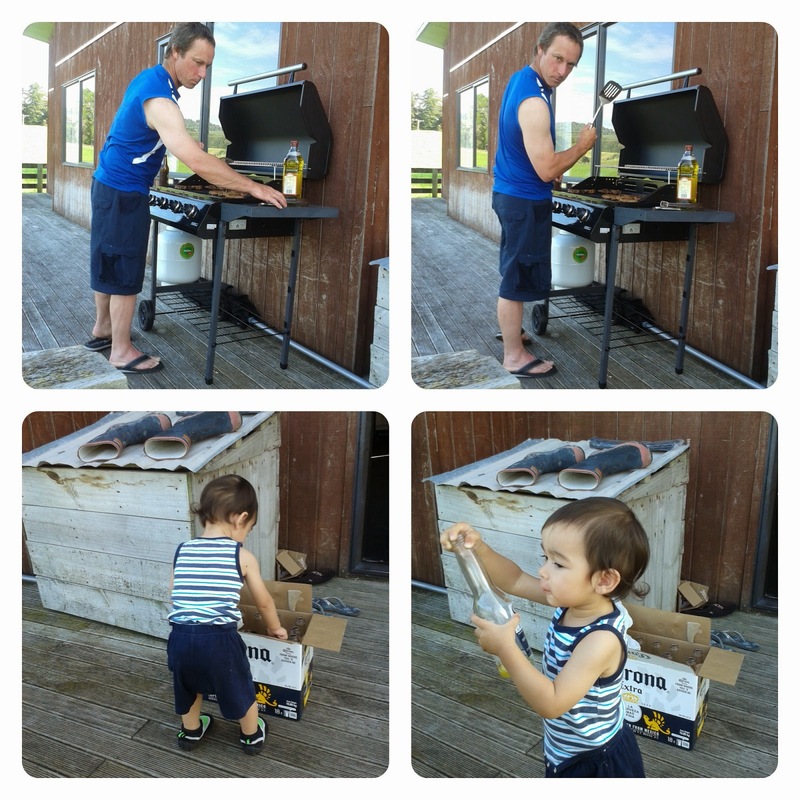 He had a great time putting these bottles in the box then taking them out again while Dad learnt how to cook on his brand new barbeque. He is such a cutie and extremely good at climbing. 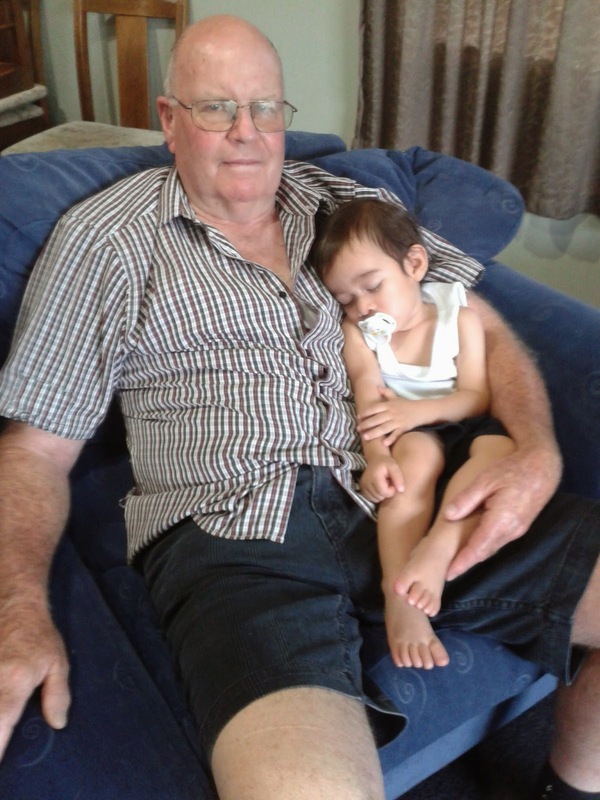 However, all kids eventually run out of steam and it seemed that Grandad had the magic touch on Christmas Eve. 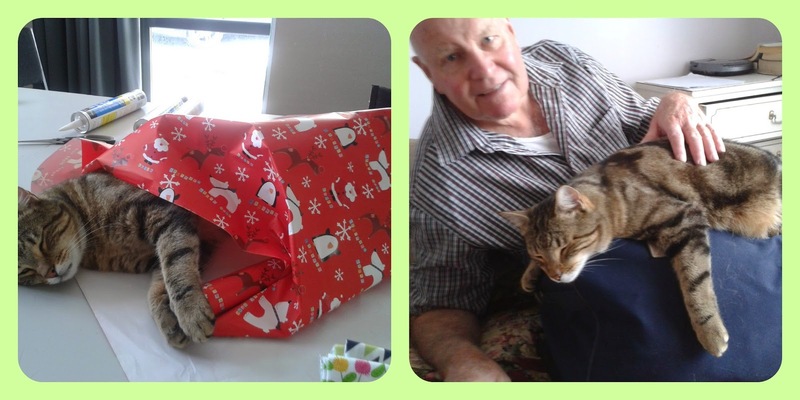 In the morning we took Dayn and Hamish with us into Te Awamutu to Rebecca and Dave's new house for Christmas dinner. Daryll had to work unfortunately and would join us for the evening meal. Wehad a lovely meal with three of our children's families, son in law Dave's parents and lots of great food to eat too much of. This is our oldest granddaughter Jessica and youngest Hayley. 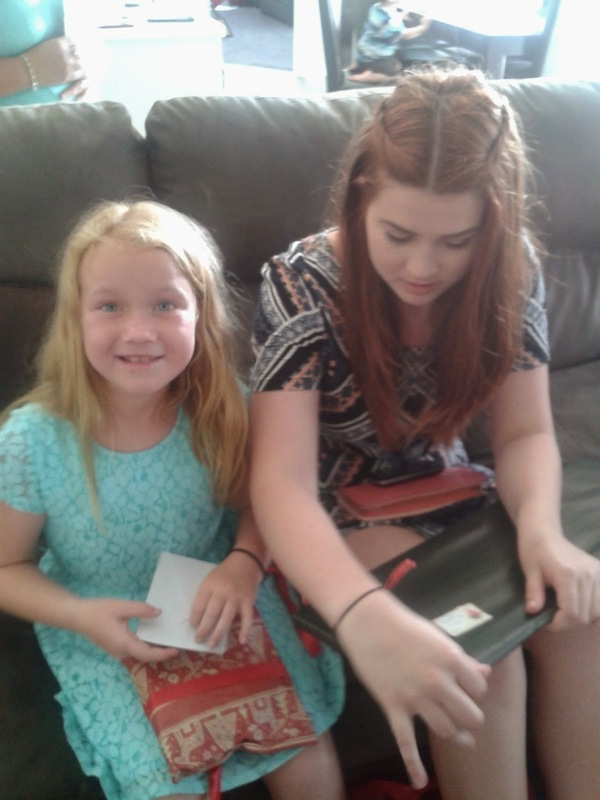 Jess came in the afternoon and was opening her presents which was of great interest to Hayley. That's a very quick rundown of our Christmas. I forgot to take photos of Rebecca and Dave's new house. It really is lovely. I will get her to send me some. 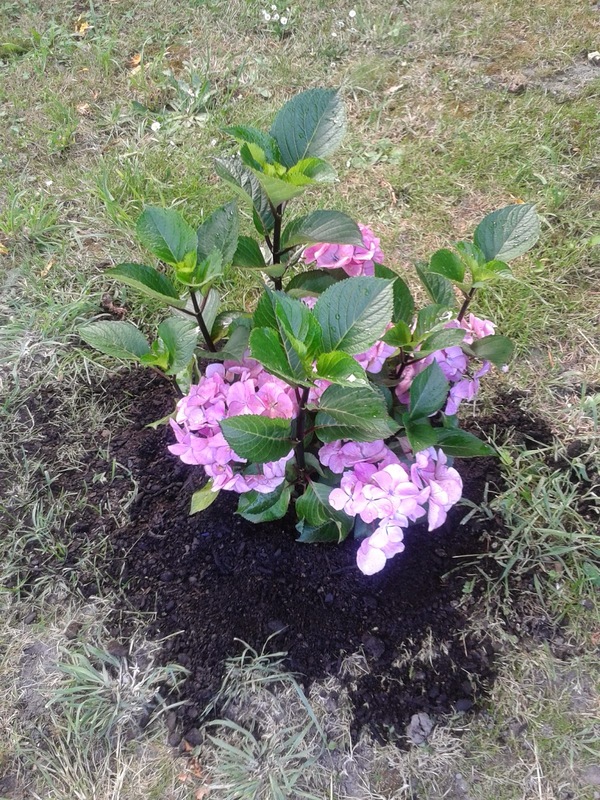 Oh, this was a gift from Rebecca and we have planted it already...love hydreanga's. Have been watering it madly as we have had lots of days in the high 20's to 30 degrees. OK, I will finish here and get back to you again very soon. I have decided it is time to get back to being regular with my posts again.